Premium Compatible Label Tapes for the Brother P-Touch 1290VP printer. Brother P-Touch 1290VP is a labelling machine compactly designed to suit any kind of environment including home, office, schools and shops. The device is highly versatile in providing customised labels with ample of styles and designs that can be of great help in labelling plugs and cables, file folders, CDs/DVDs, name badges, shelving,office equipment and much more. The machine is outfitted with an easily accessible built-in cutter, easy to read LCD display and a Qwerty keyboard. The keyboard features a Deco mode that offers 15 types of decorative label designs that can make your experience of organising your items more exciting. Plus, it provides 2 types of fonts and 8 types of styles to give out different custom labels. The labelling machine is compatible only with Brother P-Touch 1290VP Label Tapes that are TZe type. Further, the Brother P-Touch 1290VP Label Tapes are made up of six layers of materials that make the tape durable and strong. Thus, making the tape tough enough to handle extreme conditions. One more in-demand feature is that it comes with wide variety of tape cassettes with different widths and colours. Brother P-Touch 1290VP saves you a lot of time with its print speed exceeding upto 10mm per second and copy printing corresponding from 2-9. It offers maximum resolution of 180dpi. The device memory can store as much as 720 characters. The label machine's dimensions 159(Width) x 157(Depth) x 61.7(Height) and weight 485 grams makes it a compact lightweight device. The Brother P-Touch 1290VP printer offers a built-in software that allows you to organise any type of item in diverse styles, colours and label formats. The versatile features, strong and long lasting labels provide professional labels that are indispensable in any kind of environment and work space. If you are looking to organise your items with reasonable and highly customised labels, this device is a perfect choice. Q. Can I create different styles of texts on my Brother P-Touch 1290VP label tapes using this printer? A. The keyboard of the Brother P-Touch 1290VP printer features a Deco mode that offers 15 types of decorative label designs. So you can easily create decorative labels from this printer. Additionally, it also provides 2 types of fonts and 8 types of styles that gives you out different customized labels. Q. Can I use TZ tapes with the Brother P-Touch 1290VP printer? What is the difference between TZ tapes and TZe tapes? A. No, you cannot use TZ tapes with this printer. The printer is only compatible with TZe tapes. The "e" in TZe stands for "environmental", that means these tapes are packaged in an environmentally friendly manner. Also, they contain less plastic than those of TZ tapes. They also contain at least 5% recycled material. Q. From which material, the Brother P-Touch 1290VP Label Tape is created? What are the benefits? A. The Brother P-Touch 1290VP label tape is made from Polyester. Its 6 material layers make it a firm and thin (160 micrometer) tape. This makes it extremely strong, durable as well as resistant to external factors. These include heat, cold, water, light, chemicals and abrasion. Brother TZe label tapes also stick to flat and curved smooth surfaces and is suitable for both indoor and outdoor applications. Q. Why does my printer display "Check Battery!" when I press the print key? A. This is because the batteries are running low. In such case, you have to replace the batteries with six new AAA (LR03) alkaline batteries of the same type. Q. 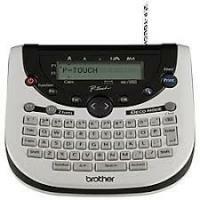 Can I use the Brother P-Touch 1290VP label tapes to DVDs and CDs? Will it damage their surface? A. Yes, you can use. It is perfectly fine to use these Brother P-Touch 1290VP label tapes on CDs and DVDs without worrying. Their surface will not damage due to these label tapes. Q. Does the Brother P-Touch 1290VP printer offers copy printing? A. Yes. With the help of this feature, you can create from one to nine copies quickly without repeating the same process. Q. What are the dimensions and weight of the Brother P-Touch 1290VP printer? A. The dimensions of this printer are 159mm(Width) x 157mm(Depth) x 61.7mm(Height). It has a weight of 485 grams that makes it a compact lightweight device. Q. Does the printer contains built in cutter or I have to cut the label tapes manually? A. Yes, the printer contains built in cutter that cuts the tape automatically. So you don’t have need to cut it manually. Q. The ink ribbon got caught in between the layers of Brother P-Touch 1290VP label tape and came out of the machine. What can I do to solve this? Press the Enter key to make new line. A return mark appears. Type the next line of information. The next line will be displayed next to the return mark. Q. Can I design creative labels with the help of the Brother P-Touch 1290VP printer? A. Yes, definitely. The keyboard features a Deco mode that offers 15 types of decorative label designs. Plus, it provides 2 types of fonts and 8 types of styles to give out different custom labels.